Only 36 percent of Kickstarter projects are successful. Adam Stager passed his funding goal of $5,000 in just 48 hours, and he still has nearly two weeks to go. Stager, a doctoral student in mechanical engineering at the University of Delaware, is co-founder of Infinity Top, the subject of a Kickstarter campaign that runs until Jan. 18. Described as the “perfect desktop companion,” this top spins above its base. 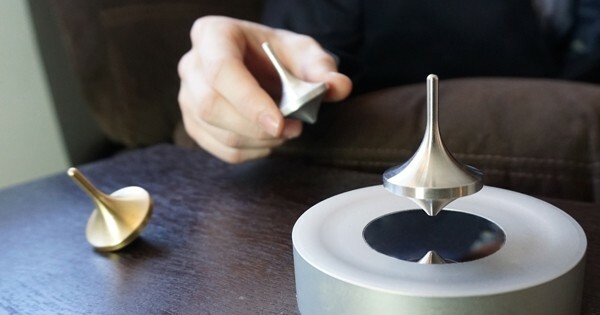 The spinning tops come in three materials: aluminum, stainless steel, and brass. Each floats at different heights due to their differences in mass. The lightest, aluminum, spins more than a half-inch above the base. The heaviest, brass, floats lower, at a quarter-inch above its base. Each material has its own unique spin feel and characteristic, said Stager. This levitation is no magic trick—it’s a magnet trick. The top contains a magnet, and its base that contains electromagnets and a ring magnet. These create invisible forces. “The top sits on a pillow of magnetic field,” said Stager. Because gravity is defied and friction is minimized, this top can spin longer than a conventional one. Advanced users can easily keep the top spinning for 30 to 45 minutes, according to Stager. This isn’t the first levitating spinning top on the market, but it is an improvement over previous designs. The electromagnet makes the Infinity Top easy to set up and also keeps it spinning longer than other iterations. “Uniquely, the Infinity Levitating Top will continuously levitate, is much easier to set up and has recorded spin times over one hour,” said Stager. What’s more, the design of the Infinity Levitating top makes it not only a fun experiment, but also a beautiful display piece, he said. Flyte, a levitating light bulb that hit Kickstarter in 2015, inspired Stager. He wanted to design a top that would float and spin at the same time, a fun twist on a nostalgic toy. He tabled the thought for about a year, until he met Caili Li, who was then a UD student earning a master’s degree in mechanical engineering. The two met in the lab of Herbert Tanner, an associate professor of mechanical engineering at UD. Li had experience with levitating objects and an interest in crowdfunding. He is the member of a family-owned manufacturing facility that has previously produced levitating objects. Li and Stager discussed their ideas and met at Stager’s house that very same night to brainstorm. They used clay, a 3-D printer, and a variety of materials to put together models and drawings. Then Li secured prototypes. As the team developed and marketed their product, Stager utilized skills he learned last summer in UD’s Horn Entrepreneurship Summer Founders program—like the importance of seeking customer feedback. In Summer Founders, Stager developed another startup company, TRIC Robotics, which develops modular robots to provide real-time information to first responders in emergency situations. Stager received a bachelor’s degree in mechanical engineering from UD in 2011. After two years as a process engineer at L’Oreal, he returned to UD to seek a doctorate. He worked with Andreas Malikopoulos, associate professor in mechanical engineering, on UD’s Scaled Smart City, and he works with Tanner, his advisor, on mobile ground robots.